Successfully Added Windows 10 Mini Laptop - 7-Inch Display, Z8350 CPU, Mini HDMI, Intel HD Graphic, 8GB RAM, Dual-Band WiFi to your Shopping Cart. The 7 inch mini laptop is there for all game enthusiasts. Providing PC games on the journey, this tiny Windows 10 laptop really improves your mobile entertainment experience, allowing you to enjoy games, movies, more like never before. This small laptop actually runs in the Windows 10 operating system, and holds a complex CPU and graphics unit. 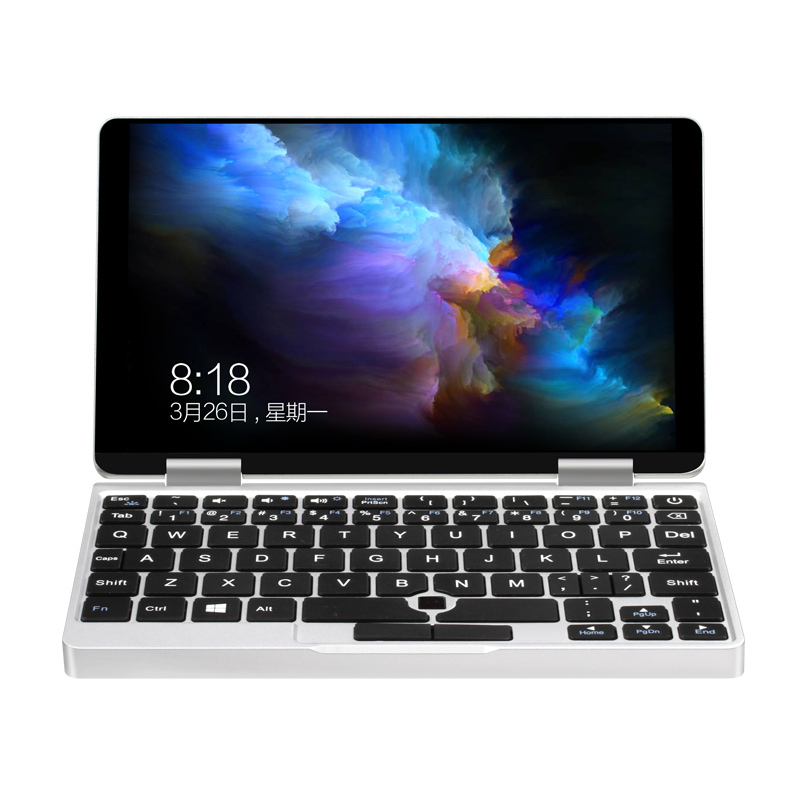 In addition, it has packaged a complete QWERTY style keyboard, allowing you to write text and browse Web through WiFi connection. Packaging Intel Z8350 CPU and 8G RAM, this mini game notebook allows you to enjoy PC games everywhere. In order to achieve fast and powerful performance, the quad core CPU guarantees all your media needs. The mini Windows 10 laptop also owns a Intel HD graphics unit that provides amazing visual effects, vivid colors and detailed graphics, while playing the most critical PC games. With 128 GB memory and 128GB SD card slot, you have enough space to store your favorite games, movies and files. Packaged with a beautiful 7 inch IPS display, this mini laptop allows you to enjoy the amazing HD resolution of the game and the media. In addition, it supports Mini HDMI output, providing you with the possibility of connecting your mini laptop to large screen TV. Its Windows 10 operating system provides access to all trusted Windows functions and programs, allowing you to write files, browse Web, and use all your regular PC programs on the journey. Packaging a powerful 6500 Ma battery, GPD Win GAMEPAD provides up to 6 hours of continuous use time - enough to pass a day full of media without having to worry about battery life. Whether you use it to browse the web, write messages, or play PC games on the go – this miniature laptop is the ultimate electronic gadget to all tech lovers and gamers out there. Thanks to its powerful hardware and Windows 10 operating system, this mini Windows laptop truly is a full-blown gaming laptop that fits inside your pocket. No matter where you’ll be heading next, with the GPD WIN GamePad at your side, you’ll never have to feel bored again. This GPD WIN GamePad comes with a 12 months warranty, brought to you by the leader in electronic devices as well as wholesale electronic gadgets..
Arabic: - كمبيوتر محمول ويندوز 10 - Chinese Simplified: - Windows 10 笔记本电脑 - Czech: - Windows 10 Laptop - Danish: - Windows 10 Laptop - Dutch: - Windows 10-Laptop - French: - Ordinateur portable Windows 10 - German: - Windows 10 Laptop - Hebrew: - מחשב נייד של Windows 10 - Hindi: - Windows 10 लैपटॉप - Italian: - Portatile Windows 10 - Japanese: - 10 Windows ノート パソコン - Korean: - 윈도우 10 노트북 - Malay: - Windows 10 komputer riba - Norwegian Bokmål: - Vinduer 10 bærbar PC - Romanian: - Windows 10 Laptop - Russian: - Ноутбук Windows 10 - Spanish: - Ordenador portátil Windows 10 - Thai: - แล็ปท็อปของ Windows 10 - Turkish: - Windows 10 dizüstü - Vietnamese: - Máy tính xách tay Windows 10.